Recently we visited the Making of Harry Potter WB Studio Tour. The props, costumes, sets and artwork from the making of the Harry Potter films impressed us hugely. From stepping into the Great Hall to seeing the scale model of the exterior of Hogwarts there were many moments of wonder. We saw and interacted with thousands of objects and items. But the moments which I found most inspiring were encountering life-size models of the Hippogriff, Buckbeak. Artists made three Buckbeak models for the filming of Harry Potter and The Prisoner of Azkaban. I have come to the conclusion that to me Buckbeak is the most amazing beast of the Harry Potter books and films. In this post I will be explaining why I am so in awe of Buckbeak. The Hippogriff is a mythical beast; part horse and part an eagle type bird. We came across the first Buckbeak model in the “Forbidden Forest”, a recent inclusion to the studio tour in 2017. Myself and Toothy instinctively bowed at the sight of the regal and fierce creature. Meeting Buckbeak created a lot of excitement before entering the forest. Later on in the tour, we came to a display dedicated to the many creature effects achieved in the films. This includes a model of Buckbeak used in the film showing him seated in Hagrid’s pumpkin patch awaiting execution. It was impressive to see these intricately built models of Buckbeak and to learn about the work that had gone into building them and making them appear and move in a life like way. The detail apparent in seeing the models close up is stunning. Real chicken and goose feathers were carefully selected, coloured and glued on by hand to create Buckbeak’s look. What I really love about J.K. Rowling’s Buckbeak is the character details that come across in the actions he takes and the way he behaves. He is a proud and yet fierce creature, not entirely animalistic or instinctive. Although wild and powerful, he is a social creature who is capable of creating lasting bonds and recognition with specific humans. He seems to recognise truly good humans and allow them to approach him. He will treat them with dignity as long as they treat him with the same dignity and respect. While the Buckbeak of the book is part of a large group of Hippogriffs’ which Hagrid introduces to the students, Buckbeak is the only Hippogriff to appear in the film. While the reason for this may have been to reduce complex effects, this results in clear focus on the majesty of Buckbeak as an individual Hippogriff and allows all the awe inspired by these incredible creatures to fall on him alone. Still, seeing a whole herd or group on screen would have been quite a sight. While of course, the Harry Potter films are amazing, this makes me appreciate how wonderful books are for taking a reader (young or old), to a place of imagination where we could try to picture such a sight as dozens of half horse, half bird creatures striding towards us. What could make a more majestic mythical beast than a Hippogriff? It’s hard to imagine a creature combined of different real life natural creatures that could be as majestic and useful as the Hippogriff. The combination of the horse and the eagle certainly make for a useful animal ally of a heroic character. It’s unique characteristics mean that it is able to judge character, be ridden and be flown. Certainly Buckbeak is a useful ally to Harry. Without Buckbeak it would have been very difficult for Harry and Hermione to rescue Sirius from the Dementors. 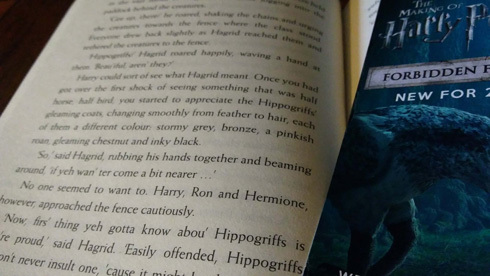 Legends and myths of the Hippogriff go back further than you might expect. The Hippogriff was first written of in the works of ancient Roman poet Virgil. Later poets wrote of Hippogriffs’ being ridden by magicians, so certainly Buckbeak is a fitting steed for a young wizard. In conclusion it is hard to imagine a creature as inspiring and purposeful as the Hippogriff combined from other creatures. As soon as I think of other animals combined it starts to look very silly in my mind, a cat and an elephant? A squirrel and a pigeon? The most majestic contender we have thought of so far is a lion back legs with a dragon head – A Drion perhaps? If you love magical books check out our guide to magical reads for children here. And if you are looking for great gifts for Harry Potter fans check out our guide to Funko figures for book fans including special editions of the Harry Potter books and cool figures to accompany them!